Leon Xie, General Manager, Sports Marketing of Alibaba Group, and Iain Downie, FIFA's Director Marketing Sales and Strategy, launched the partnership. 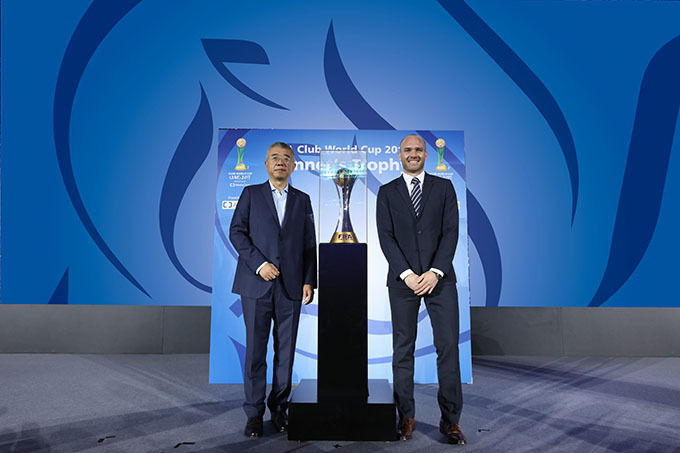 Guangzhou, November 22, 2017 - Alibaba Group and FIFA announced today Alibaba Cloud - the cloud computing arm of Alibaba Group – as Presenting Partner of the FIFA Club World Cup until 2022. The announcement was made on the occasion of the Computing Conference held by Alibaba Group in Guangzhou. Commenting on the agreement, FIFA's Director Marketing Sales and Strategy, Iain Downie said: "We are aware of the substantial value that Alibaba Cloud provides to business in terms of technical support and global reaching services. We can only see great potential in this fresh collaboration related to the FIFA Club World Cup." Beginning at this year's edition of the tournament, which will be hosted in the UAE from 6 to 16 December, as the Presenting Partner, Alibaba Cloud will design and provide the MVP (most valuable player) award. In additional celebration of the partnership, the FIFA Club World Cup Winner's Trophy was exhibited during the announcement and at the Computing Conference. The FIFA Club World Cup is a FIFA-organised international football tournament, featuring the current champion football clubs from each of the six football confederations, as well as the national league champion from the host country. In previous tournaments some of the biggest footballing stars in the world have participated, including global superstars such as Lionel Messi, Luis Suárez and Cristiano Ronaldo, who had all been named tournament best players in past editions of the tournament. Simon Hu, Senior Vice President of Alibaba Group and President of Alibaba Cloud said: "As one of the world's leading cloud computing providers, we are striving to make technology more inclusive to benefit more people's day-to-day life and well-being. By becoming a major partner of the FIFA Club World Cup, we hope to show how our technology can bring new aspects of fun and enjoyment to fans of sports, including those people who might have had barriers to access or participate before. For Alibaba Cloud, this is the true meaning of inclusive technology." Alibaba Cloud's powerful cloud computing infrastructure has proven its value proposition by supporting massive spikes in traffic and transactions during peak events such as Alibaba Group's Global Shopping Festival. Within the sports industry, Alibaba Cloud works towards providing cloud computing infrastructure and cloud services to support operation efficiency in a secure manner, including by supporting big data analytics requirements. Established in 2009, Alibaba Cloud (www.alibabacloud.com), the cloud computing arm of Alibaba Group, is among the world's top 3 IaaS providers according to Gartner, and the largest provider of public cloud services in China, according to IDC. Alibaba Cloud provides a comprehensive suite of cloud computing services to businesses worldwide, including merchants doing business on Alibaba Group marketplaces, start-ups, corporations and government organizations.